Are you worried about tartar and stains on your teeth? Indeed, it is an issue if “hard yellow stuff” continues to be on your teeth. Your teeth are not just getting discolored. The problem is much bigger – your teeth, gums, and oral health are at stake. Tartar and stains on your teeth can cause tooth decay, cavities, gum disease, and halitosis. The bacteria can percolate down to respiratory and digestive tracts causing health issues and even impact the function of glands. Plaques result in irritation and inflammation of gums that lead to tooth decay. And above all, no one appreciates your lack of oral hygiene and foul smell emanating while talking to others. How to remove tartar and stains on your teeth at home and without the need to frequent dental clinics? The answer lies in this innovative Ultrasonic Dental Toothpick. Emitting LED light, the silicone flossing tip of this ultrasonic teeth cleaning pick has superior cleaning ability similar to professionally cleaned. The stainless steel tip makes it possible to gently remove hard tartar and stains while sonic pulses eliminate plaque instantly. The ultrasonic tooth whitening pick is enamel safe, battery operated, and portable. You can clean stains both between teeth and deposited on the tooth surface. 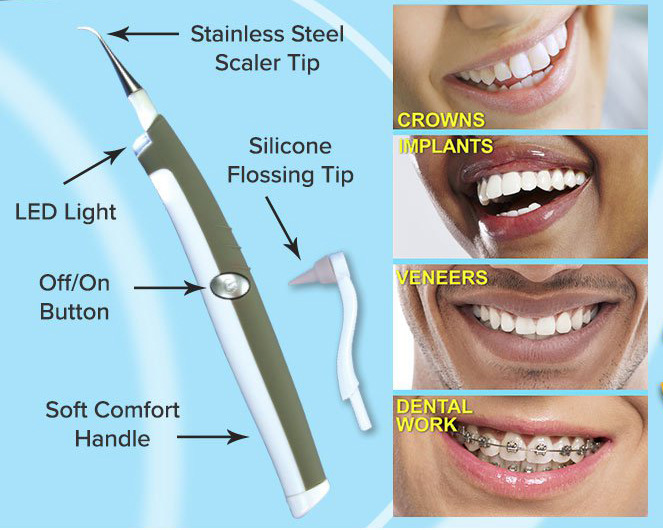 And the greatest advantage is that it does not pose a threat to crowns, implants, and veneers. Limited Offer! Buy this Ultrasonic Dental Toothpick for Tartar, Stain Removal and keep your teeth safe.